I wasn't quite sure what to expect from today's comic based on the cover, but it certainly wasn't Biblical epic! King Og was apparently ruler of a nation that Moses and the Israelites conquered. He is mentioned in Deuteronomy, and did, it seems, have an iron bed. So we have a cute little time travel story in today's issue, but I wonder if it's not actually something more. I wrote a few years back for Sequart.org an article about Christian comics texts. I'd thought through there being different kinds: the faithful adaptation, the "paraphrase," and the paratexts. I wonder if a story like this one, not quite a paraphrase, but an insertion of contemporary pop culture into ancient Jewish tradition, would fit somewhere in there? I'm intrigued, now, by this series. 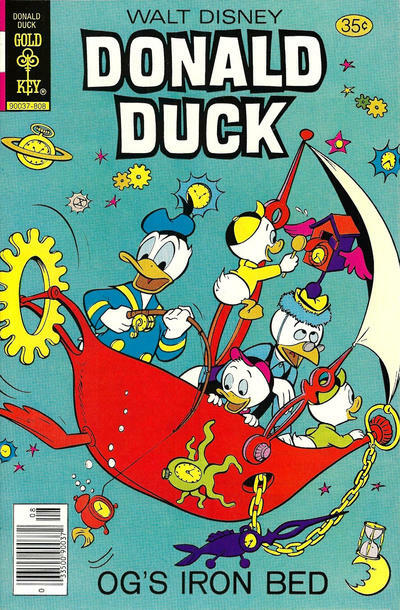 It's said that Carl Barks instituted this tradition of the Duck comics being more adventurous, and slightly more serial, than a typical cartoon adaptation comic (see my thoughts on Bugs Bunny a few days back). It's interesting to see that it was carried on even after Barks' time on the titles. This is the last of the Western comics I'll be reading for now. I've got a stack of their more serious titles lined up for next month, but we'll finish with Donald, who heralds the coming of another duck character a little later on this month. Of the comics I read this week, Andy Panda and today's comic were the ones that grabbed me most. I'll have to see if I have any more kicking about!